The British government treats international law and the Geneva Conventions with contempt as it ignores the petition of an expected 100,000 signatories to bring a suspected war criminal to justice apparently because of Britain’s dependency on Israeli arms manufacturers and the supply of cheap generic drugs to the UK’s National Health Service. The fact that Israel is the only undeclared nuclear weapons state in the world and is outside the inspection of the IAEA and a non-signatory to the internationally agreed nuclear Non Proliferation Treaty (NPT) plus one that also refuses to endorse the Chemical Weapons Convention (CWC) is, astonishingly, of no concern to Mr Cameron who is a staunch supporter of the Conservative Friends of Israel – the British arm of AIPAC, the American Zionist pressure group that admits to be financed from the gambling profits of American casinos. This action of immunity taints the current British government as one that is willing to collude in the alleged war crime of the killing of over 2000 civilians in Gaza. It is an act of political expediency that devalues international law and implicitly condones Israel’s illegal settlement of over 500,000 of its citizens on occupied Palestinian land. 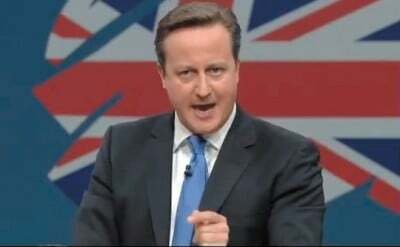 The British electorate will, no doubt, question Mr Cameron’s integrity and competence as he dangerously supports a state with a German-built, nuclear-armed submarine fleet that could blow Britain out of the water in five minutes, should the Israeli Prime Minister snap his fingers. How politically insignificant has former ‘Great’ Britain become under a Conservative government that acts as a compliant lapdog to an undeclared nuclear state with a population just one tenth that of the UK that is not even a member of NATO? What a complete reversal of political power from the head of what was once the greatest commonwealth of nations in the world to a subservient state that wines and dines an alleged war criminal who oversees the persecution, and killing, of the majority indigenous people of Palestine in his quest for regional power. This is a story of covert deals and hidden loyalties that will eventually end in a regional war that will spread to and engulf Europe unless the EU acts decisively to stop AIPAC-funded Israeli plans to dominate the Middle East and the Gulf.